Our first minisode of the season, next one will be a full length episode. Kenny finally finds the courage to ask out Alicia Van Harren, well, eventually. The editor of The Watch List asked me to write a review of an episode of Out With Dad. An interesting concept: a filmmaker writing their own review? I enjoyed writing it. It was easy to do, because making this episode was so much fun and I found I enjoyed it as an audience member. You might find it interesting to give it a read, as I wound up sharing some behind-the-scenes stuff. Click here to read. Voted #2 in We Love Soap‘s Indie Soap of the Week poll, for the week of July 17-23, 2011. Thank you to everyone who voted! Laura Jabalee as Alicia Van Harren. Our newest member of the cast, in the role of Alicia, is Laura Jabalee! Read her introduction post here. I love Kenny’s dad so cool. I hope my family is like that of her. Little by little I am coming out with selected people my friends they too are shock but some supports me i know that by my self i like girls. ever since i am in junior high. this is the best series that I’ve seen, I can’t wait for the next chapter!!!! Way to go Kenny. Can’t wait for the longer episode which is in five days. To be honest though, I like the longer episodes mixed with the mini-sodes. I really couldn’t see this story fitting into a long episode. Plus, I thought It was a really cool way to see the exposition of Kenny asking out Alicia. Love the series. Keep up the awesome work. I’m a faithful reader of AfterEllen. That’s how I discovered your show. And I’m pretty sure I am gonna be a FFF (French Fan Forever) of “Out with dad”soon. Actually, it gave me the idea to tell my Dad I was gay. My mother died years ago and I would’nt like to cut the link because of that. But, I think I’m old enough now (21). Keep thinking about it. Well, you put a smile on my face for saying so! Loved this episode! How short it was made me wanting even more! I’ll be counting down the hours until August 4th! I’ve been watching this series since the first season, and the wait for season 2 seemed like a lifetime! 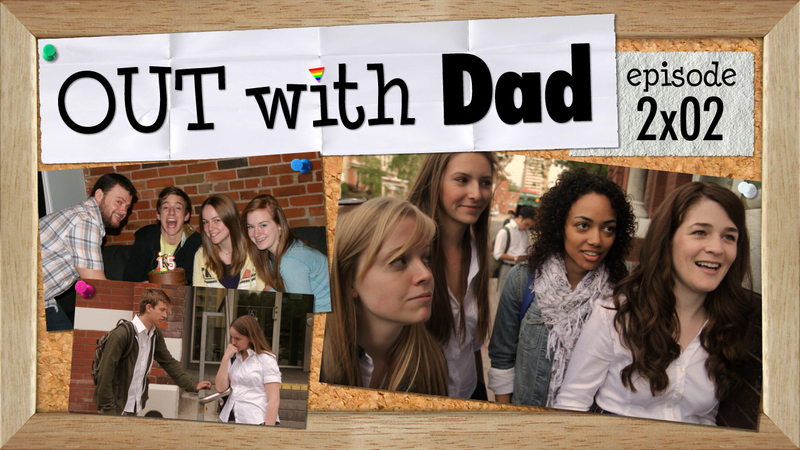 This web series has become very successful! How many seasons do you plan on doing? Brazil wants to watch the show! Thanks you Jason and all team ! It’s just great art realy ! I’ve tried to watch this on two different computers – it doesn’t like me, as it won’t work 🙁 Oh well. I’m sorry you’re having problems. Would you mind telling me what kind of computers you’ve used? What operating system, which browser, etc? I’d like to report this to our video host. I have Windows 7 on both machines. One I’m using IE, on the other Google Chrome. On the PC it brought up a black screen where the video is, with the words something along the lines of “We are unable to play this video”. On my laptop – which is a Lenovo and has IE for the browser – the video doesn’t load at all, it brings up an “internet explorer cannot display” this page message where the video is embedded in the site. I’ll try it at work tomorrow and see how I go. Great ep!! Short and sweet! I would like to make a suggestion if I may…You could make the background(?) of the captions a little bit darker because sometimes is difficult to see.Thanks! Keep up with the good work. Greetings from Argentina. I’m afraid we don’t have any control over the appearance of the subtitles – but I have asked our video host if they could do something about that. You’re not alone! Yup, this show is very proudly Ontarian! I have to agree. Kenny is just adorable! Not yet! They are coming! Looking forward to the next one. Keep it up. Tee! That is such a nice thing to hear! I’d be honoured to be interviewed by you. You’ve got my email address, so please don’t hesitate to send me questions! If you’d like, I’ll link back to the interview on your site from here. Nice to see Kenny again. He’s just the awesome friend Rose is very fortunate to have. Short but as always, enjoyable. We could all do with a bit more Kenny, right? There’s more of him to come this season! Kate Conway did perfectly as always especially when she awkwardly goes to cover her dimples and Corey Lof is totally hilarious and realistic with his stammering, uncertain bumbling about as he tries to ask Alicia out. And yes – Corey is a riot! It was hard to hold the camera steady from my wanting to laugh! haha ay kenny! he is adorable! I swear that is what goes through our heads when asking someone out! Yup, we’ve all been there before! Well, maybe not Rose, yet. Probably not the best person to ask for advice! Incredible! Keep them coming =) Cant wait for the next one! This just left me with a big smile on my face .Thank you. And you’ve put a smile on my face! You know what? We didn’t really have a chance to film behinds the scenes this time. There’s so much to do – and it was a very intense film shoot, we had to focus! Sorry it’s such a long wait! But don’t worry, next episode is much longer and Vanessa is in it. Thank you for your comment! Don’t worry, while I’m enjoying my summer I’m keeping on top of things! The next episode is already very close to being finished. Great episode, as always. Can’t get enough of this web series. However, I find that in this episode the music was a little too loud and therefore distracting. Hope I don’t come across as a nitpicker. I’m glad you’re enjoying our series. You know, I was wondering myself if I made the music a little too loud… Hmmm. It’s a tough balance. Maybe I’m too much of a fan of Adrian’s music, I was reluctant to make it any quieter! Thanx for this great series!!! I love it so much! But why does is take so long (2 weeks) until the episode appears?? It takes a long time because there’s so much to do still… and this isn’t our full-time job. I still have to do my normal job on top of all the editing, effects, and so forth. Maybe one day this CAN be my job, and then it could be more frequent. And even longer episodes! Wouldn’t that be great? One important thing: I’m sadly no publishing company but it would be so cool if you could, when season 2 or even a 3rd season is complete, to recut everything together to turn it into a movie. I noticed that most of those Episodes were scenes that could easily be edited to a movie. That movie would be another very good insight into the difficulties of coming out as a teen. We did something similar for season one, it was re-cut to be a 55 minute long edition which was just the right length for our local cable company to broadcast. They’ve aired it a number of times as a “television special”. They showed it a lot during pride week as a matter of fact. This season is MUCH longer, so ya, maybe a movie? Next one will be longer – over 10 minutes! Great! Of course I want more!!! When it will be??? Thanks! Greetings from Argentina. Greetings from Canada! There will be a longer episode up two weeks from today. I wish we could release them more often – and that they could all be longer! I have so many stories I want to tell, and it kills me that it’ll take so long to tell them! Unfortunately this isn’t our full time job. One of the reasons we spread them out is so that we can fit it into our regular (already) busy lives. I can not wait either! We are alternating longer episodes with minisodes. So next up: a nice long episode! yesss!! looking forward for them then. 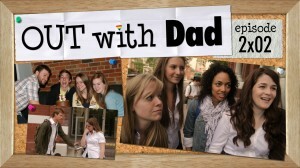 I LOOVE that webserie! If only it was a little bit less long for a new episode to come out!